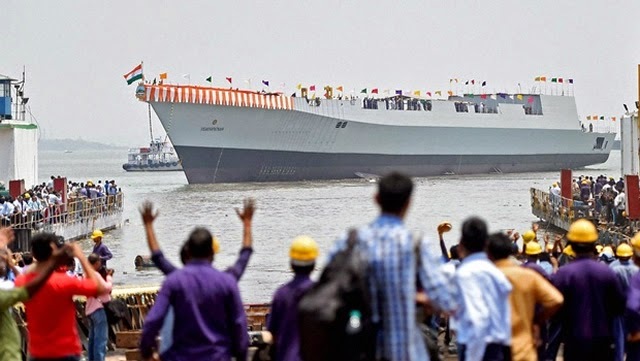 The Indian Navy announced the First ship of Project 15B Guided Missile Destroyer christened ‘Visakhapatnam’ was launched on 20 Apr 15 at a magnificent ceremony at Mazagaon Dock Limited (MDL), Mumbai. The ship was launched from Slip Way No. 2 in MDL, Mumbai. The Chief of the Naval Staff, Admiral RK Dhowan, was the Chief Guest for the occasion. In keeping with the nautical traditions, the ship was launched by Smt Minu Dhowan, wife of The Chief of the Naval Staff. After an invocation to the Gods was recited, she broke a coconut on ship’s bow, named the ship and wished the shipand “crew to be”, good luck. 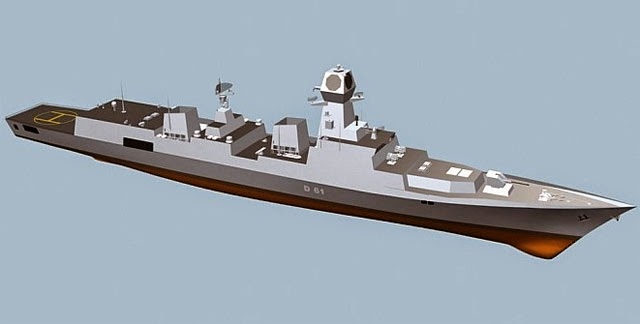 Based on Project 15A Kolkata-class, the four ships of Project 15B ships being built at MDL,Mumbai have been designed indigenously by the Directorate of Naval Design,Delhi and bear testimony to the acclaimed legacy of Naval designers. With a displacement of 7300 tons, each ship will be spanning 163 meters in length and17.4 meters at the beam and will be propelled by four gas turbines to achieve speed in excess of 30 knots. The P15B destroyers incorporate new designconcepts for improved survivability, sea keeping, stealth and maneuverability. Enhanced stealth features have been achieved through shaping of hull and use of radar transparent deck fittings which make these ships difficult to detect. These ships will be equipped to carry and operate two multiple role helicopters. These ships are also packed with an array of state of the art weapons and sensors, including vertically launched missile system for long distance engagement of shore and sea-based targets. The ship is one of the few warships of the world to be fitted with a Multi Function Surveillance Threat Alert Radar to provide target data to Long Range Surface to Air Missile system. The MF-STAR and LRSAM system is being supplied by M/s BEL. To protect against incoming airborne and surface threats at medium and close range, the ship has 76mm and 30mm gun mounts. The first ship of Project 15B is scheduled for delivery in July 2018. The remaining three ships will be delivered at an interval of two years each.